Encompassed in the George Town UNESCO World Heritage Site (and also beyond the site) are places of significant heritage value, which require conservation or the necessary upgrading and rejuvenation to raise awareness and instil appreciation of our cultural heritage. Sia Boey is a site that was once a bustling trading hub in its heyday with exceptional significance to Penangites. 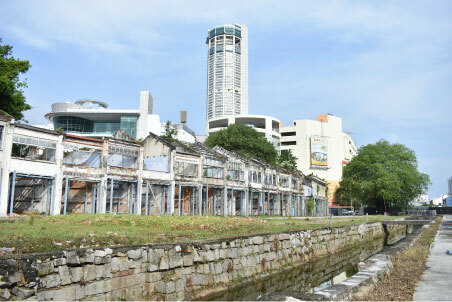 George Town World Heritage Incorporated, in cooperation with Penang Development Corporation, will bring Sia Boey back to its glory days by incorporating both development and heritage conservation within the site, and establishing the Sia Boey Urban Archaeological Park, of which our organisation is the Facility Manager. The Sia Boey Rejuvenation Project was launched on 25 March 2018, and it includes the rehabilitation of the Prangin Canal, conservation of the old Prangin Market and upgrading of the landscaping. The site would be redeveloped and conserved while prioritising the adaptive reuse of heritage buildings and providing ample public space. Also through an integrated management plan, Sia Boey will be enhanced for the local community, with plans for it to serve as a transport hub, green lung, and arts and culture centre for capacity building activities. Sia Boey is also one of the largest archaeological sites in George Town following the discovery of a granite structure which was identified to be the Old Prangin Canal Basin in 2016. 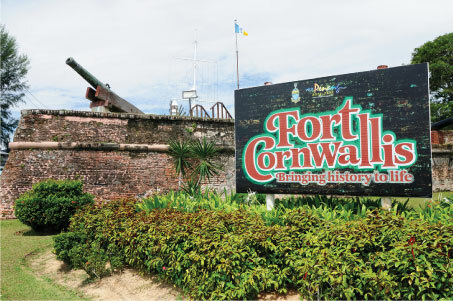 Fort Cornwallis, a star-shaped fort built by the East India Company facing the shore of George Town marks the presence of the British colonial era. Initially a fort to defend pirates and intruders, the site now serves as a Category I site and a popular hub among tourists. George Town World Heritage Incorporated ensures the site is well taken care of, with the ongoing excavation works to uncover the moat structure that originally surrounded the fort, and conservation works on the structures. The excavation project is an initiative by the State Government of Penang, and it is an effort to restore the authenticity and heritage significance of Fort Cornwallis, as outlined in the Fort Cornwallis Conservation Management Plan 2016. On 19 February 2018, two historical cannons, believed to be over 200 years old, were discovered during the excavation of the moat, while nine cannonballs were discovered in the same trench from 26 – 28 February 2018. The cannons and cannonballs have been transferred to Universiti Sains Malaysia’s Centre for Global Archaeological Research for conservation. Almost a year later on 27 January 2019, another cannon and a mortar, believed to be over 200 years old were unearthed. Both cannon and mortar are sent to Universiti Sains Malaysia for further restoration and analysis. Archaeological works are still continuing at the site. The Northam Road Protestant Cemetery is a Category I heritage site within the George Town UNESCO World Heritage Site. This cemetery and the adjoining Roman Catholic Cemetery were created soon after the British East India Company established a settlement in Penang in 1786. The earliest recorded burial is for William Murray in 1787, suggesting that the cemetery was utilised shortly after Captain Francis Light’s arrival in Penang. At the time, it was beyond the precincts of town on partly swampy ground. 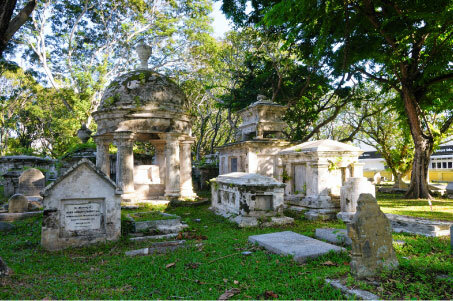 The cemetery is the final resting place of many important personalities connected to the establishment and early growth of George Town and Penang, including its founder Francis Light, governors, officers, East India Company officials and merchants. George Town World Heritage Incorporated has been conserving and restoring the graves and inscriptions, as well as conducting maintenance works at the cemetery since 2013, with more than 300 graves restored since December 2018. There are a total of 432 graves at the site. The conservation and restoration are to ensure the graves remain protected from deterioration and damage. 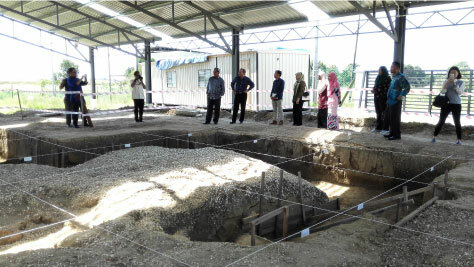 George Town World Heritage Incorporated sits on the Guar Kepah Archaeological Advisory Panel to the Guar Kepah Archaeological Site in Kepala Batas, northern Seberang Perai, providing input on the proceedings towards its inscription as a UNESCO World Heritage Site. On 17 April 2017, a complete skeleton (dubbed the ‘Penang Woman’ by the media) estimated to be about 5,710 years old was discovered at the site, putting the town of Kepala Batas on the map as it proves the existence of Neolithic prehistoric man in Peninsular Malaysia. The Neolithic era is the youngest part of the Stone Age, and it is the final stage of cultural evolution among prehistoric humans. An intact shell mound (or shell midden) was also found earlier at the site, possibly the largest ever found in Southeast Asia. It is seen as an important discovery as shell middens are essentially prehistoric refuse pits that could contain varies types of artefacts and even human burials. With such discoveries, the State Government of Penang is seeking the UNESCO World Heritage Site status for Guar Kepah. The Guar Kepah Archaeological Gallery is also located at the site, as public archaeology is promoted via a state-wide initiative for the community to actively participate in the conservation of cultural heritage.